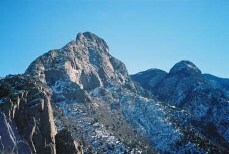 There are over 275 Geocaches hidden in the Sandia Mountains (as of April, 2008). Geocaching is basically a high-tech treasure hunt. Someone hides a "cache" (typically a tupperware container or ammo cannister) with several low-value items in it (for example, keychain, yoyo, pocketknife, Hotwheels car). They post the coordinates of the hiding place on the http://www.geocaching.com/ web site, and a short description of the hike, or how to get there. People use a GPS receiver to make their way to the published latitude and longitude and try to find the cache. (Click here to learn more about the basics of GPS.) When they find it, there is a log book inside to sign-in, and the finder can take a trinket as a souvenier if they also leave another item of comparable value. The finder then can go to the geocaching web site and log onto that cache's web page, and post a note that they have found it. Caches can vary in difficulty from quite easy to a four hour (or more) round trip hike. A nice Introduction to Geocaching is available for more information. GC14K1K N 35° 17.666' W 106° 27.880' "Strip Mine Trail ""Unarchived "" by manzano wolfe"
GCWAWY N 35° 10.393' W 106° 28.534' "It's a Hoot too. by CedarCrestHiker"
GC1A7FB N 35° 05.000' W 106° 28.438' "License and Registration, Please. by ZenGuru"
GC1A833 N 35° 04.935' W 106° 28.109' "Moki's ""U"" Vue by frankandginny"